CKT has designed the CKT2170 Series specifically for high-volume interconnection testing of high-density printed wiring devices such as ceramic substrates, chip-carriers, multi-chip modules, liquid crystal displays, etc. A system for testing chip-carriers is illustrated above. The CKT2170 Series systems are turn-key systems consisting of either a manual or automatic product handler, probing heads and integrated CKT2175 test electronics. The mechanical portions of the systems will generally be customized according to product form factors, test throughput requirements, test point density and alignment requirements. The CKT2175 test electronics are the standard electronics, with the form-factor of the switching cards is customized in order to fit a specific packaging requirement. Programmable test voltages to 250 VDC. Insulation resistance testing to 100 megohms. Opens (continuity) testing to < 1 ohm, with currents to 50mA. High throughput. A product requiring 5,000 tests will generally be tested in under 10 seconds, including mechanical handling time. Available with single-sided probing, or simultaneous top / bottom probing. Probing pitches as small as 0.008 in. (200 microns). Integrated vision system for precise and automatic product alignment. CKT invites inquiries from manufacturers of the above described products and who are searching for a testing solution. 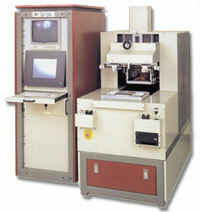 With many years experience designing and manufacturing such test systems, CKT is the company to provide that solution.